A Pergola is a horizontal framework, supported on posts, that carries climbing plants and forms a covered area. Pergolas are perfect for giving just the right amount of shade during outdoor events! Our Creative and Innovative Design Team are eager to help you plan your Pergola Structure! With plenty of Original Designs, or something we've done previously, we know you will find something you Love! All of the material used for your project will be purchased specifically with your project in mind! Every home is unique, so your new backyard Hardscapes should be unique in nature as well! From the type of wood, to the color of stain, we want you to be happy every step of the way! Need something to be proud to brag about? We have your back! 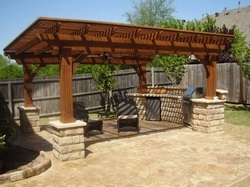 We want to give you the satisfaction of watching your neighbors jaws drop at the sight of your new Pergola! Let us give you something to knock your socks off. We love giving customers that WOW factor! Nothing makes us more happy than making our customers happy! We survive on Customer Satisfaction!